Taiyo Europe GmbH, Sullalbero Srl. Algae is the seemingly unlikely term that is being discussed at the heart of EXPO Milano 2015. 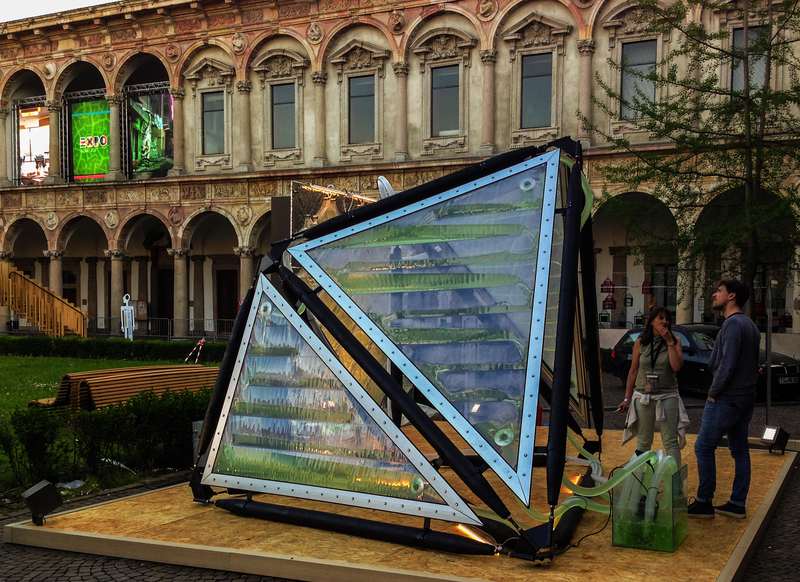 As part of the Future Food District project, curated by Carlo Ratti Associati at the central crossroads of the EXPO site, a new vision of future bio-digital architectures powered by microalgae organisms has been proposed by the London based ecoLogicStudio. This vision is about to become reality as a large canopy roof and vertical facades are unveiled, designed by ecoLogicStudio [Claudia Pasquero and Marco Poletto] with local architect Cesare Griffa. Full scale mock-ups are being previewed this week as part of INTERNI’s Exhibition-Event ‘Feeding New Ideas for the City’ – Cortile d’Onore, Università degli Studi di Milano, Festa del Perdono 7 (7-18th April 2014). 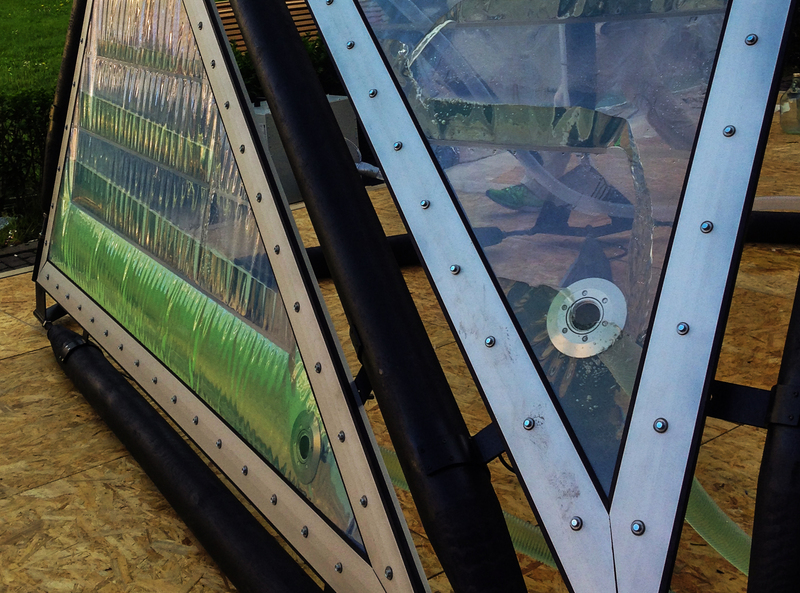 These prototypes constitute a revolution in the conception of building integrated farming and urban agriculture. “The functioning principle of the prototypes is based on the exceptional properties of microalgae organisms, which are ten times more efficient photosynthetic machines compared to large trees and grasses” – explains Carlo Ratti, curator of the Future Food District. 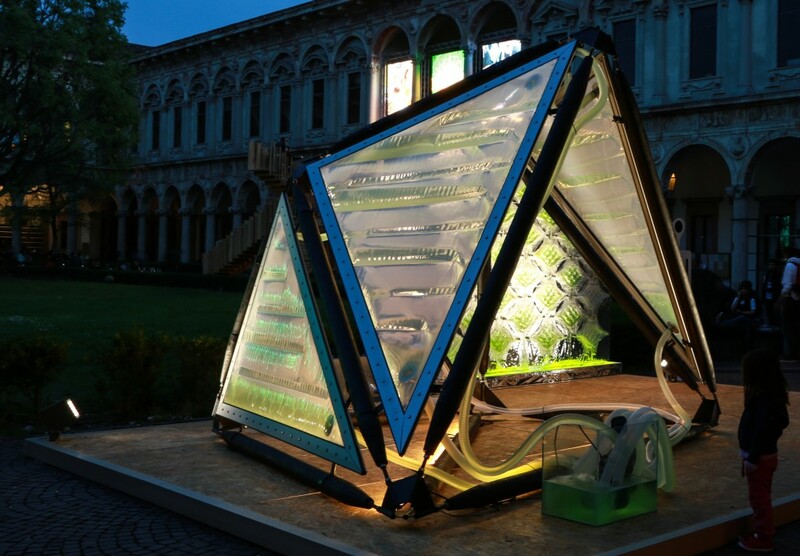 The Urban Algae Canopy, based on ecoLogicStudio’s six years long research on building integrated bio-digital systems, is presented here with a 1:1 scale prototype of the world’s first bio-digital canopy integrating micro-algal cultures and real time digital cultivation protocols on a unique architectural system. The exceptional properties of microalgae organisms are enhanced by their cultivation within a custom designed 3 layers ETFE cladding system. Such system was developed through a tight collaboration between ecoLogicStudio and Taiyo Europe and represents a radically new interpretation of the possibilities of the traditional ETFE cladding system. A special CNC welding technology is at the core of it and enables ecoLogicStudio to design and control the morphology of the cushions under stress as well as the fluid dynamic behaviour of the water medium as it travels through it. The flows of energy, water and CO2 are therefore regulated to respond and adjust to weather patterns and visitors’ movements. As the sun shines more intensively algae would photosynthesise and grow thus reducing the transparency of the canopy and increasing its shading potential; since this process is driven by the biology of mico-algae is inherently responsive and adaptive; visitors will benefit from this natural shading property while being able to influence it in real-time; their presence will trigger electro valves to alter the speed of algal flow through the canopy provoking an emergent differentiation across the space. In any moment in time the actual transparency, colour and shading potential of the canopy will be the product of this complex set of relationships among climate, micro-algae, visitors and digital control systems. 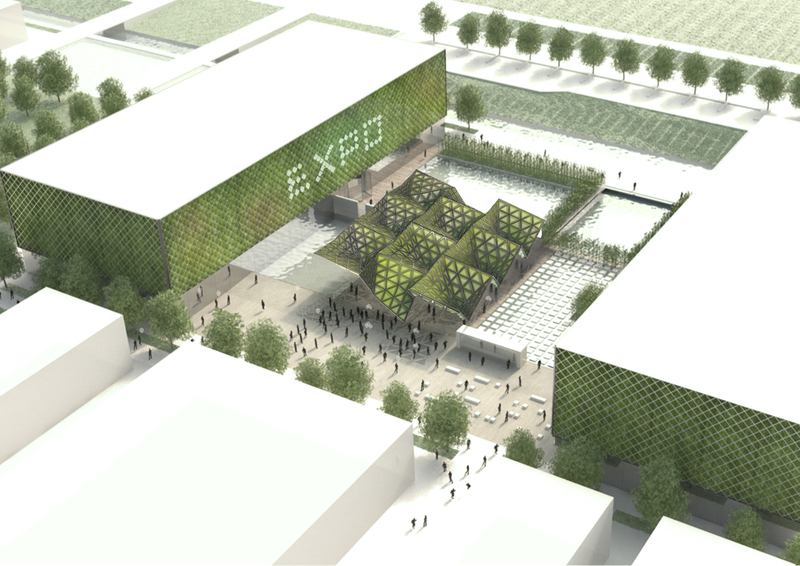 Once completed as part of EXPO2015 Future food District the Urban Algae Canopy will produce the oxygen equivalent of 4 hectares of woodland and up to 150kg of biomass per day, 60% of which are natural vegetal proteins.